How the movement of residents and spectators will be managed during Formula 1 Azerbaijan Grand Prix 2019? On the eve of the event, Baku residents and spectators will be able to move freely around the track. They can access closed zones alongside the circuit through underground and overpass passages assigned in advance. Temporary overpass passages will be based at the crossing of Azerbaijan Avenue and Istiglaliyyat Street, as well as at the city’s three intersections - the Khagani - Rashid Behbudov streets, Azadlig Avenue - Khagani Street and Neftchilar Avenue-Rashid Behbudov street. When traffic flow will be restricted on the roads? 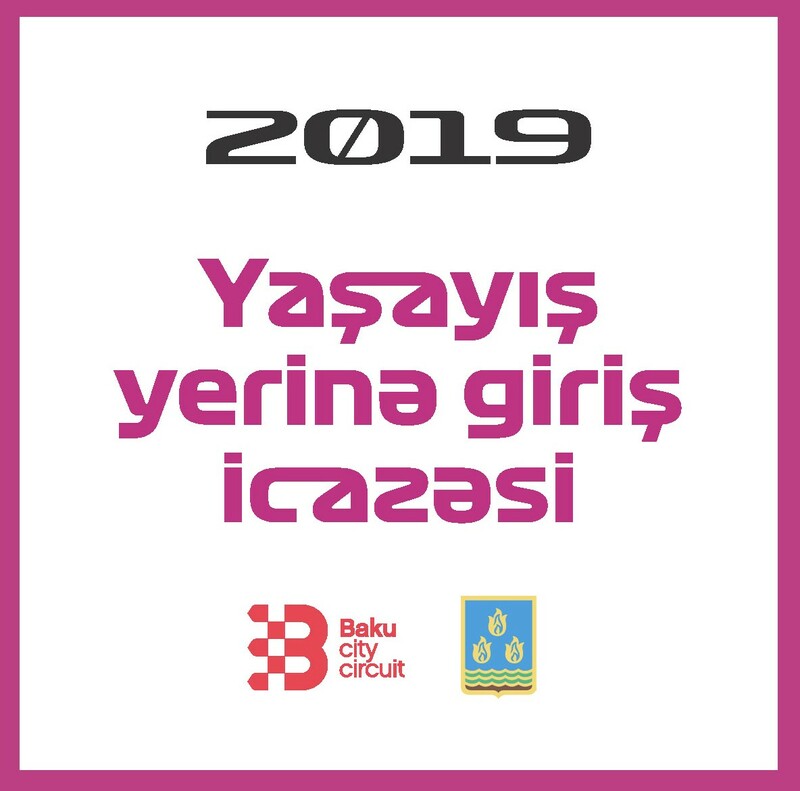 The roads lying within Baku City Circuit and the areas around the track will be closed for the traffic starting from April 22nd from 01:00 to 06:00 on April 30th. In which areas traffic flow will be restricted? The area where traffic restrictions are imposed is divided into 3 zones. The first zone includes the streets lying along the Old City - Icheri Sheher. Zone 2 covers Azadlig (Freedom) Square and the areas around it. Finally, Zone 3 will be based on the UN 50th Anniversary Street. Only Resident Access Permit holders will be allowed to enter the above-mentioned zones. The Resident Access Permit stickers will be distributed to local residents, tenants and businesses located around that require access inside of the residential zones. The distribution of the stickers starts on 11 April onwards, till 28 April inclusive. The permits (stickers) are required to be displayed on all cars’ windshields. It is important to note that due to entertainment programs at Chrystal Hall this year, on 27th and 28th April, the road from Azneft circle to Flag Square will be closed for traffic between 17:00-04:00. By whom special entry permits (stickers) will be distributed? The distribution of the stickers starts on 11 April onwards, till 28 April inclusive. Zone 1 entry stickers will be distributed at the Azerbaijan National Encyclopaedia Building, while Zone 2 permits will be provided by the Housing and Communal Services Area N.4 and Zone 3 by the Housing and Communal Services Area N.58. For more detailed information about Zone 1 please call (012) 492 24 27, about Zones 2 (012) 498 88 06 and Zone 3 (012) 492 41 85. Will vehicles be able to enter the Zones? The movement of traffic in Zones 1 and 2 will be allowed at night only from 00:00 through 06:00. Traffic will be open in Zone 3 during the day; however, only vehicles with a permit (stickers) will be able to enter the Zone at any time. The entrance for Zone 1 will be located at the intersection of the Neftchilar Avenue and Asef Zeynally Street, for Zone 2 at at the intersection of the Rashid Behbudov and Khagani Streets and for Zone 3 at Lermontov Street (Baku Waterfalls Park). Are there any parking areas for residents who live in the designated Zones? The underground parking garage in Winter Park will be free only for vehicles with Resident Access Permit stickers. Will there be any alternative roads for vehicles so that they can use during on the eve of the event? Yes. You can see these alternative roads in blue on the map which have been considered for continuous traffic flow. Please be advised that parking on these roads will strictly be prohibited, although they will stay open for traffic. Which streets will be entirely closed for traffic? The streets highlighted in red on the road map will be entirely closed for traffic from 01:00 on April 22nd to 06:00 on April 30th. Traffic management will be carried out by the Main Traffic Police Department. When access restrictions for residents to the National Seaside Park will be implemented? 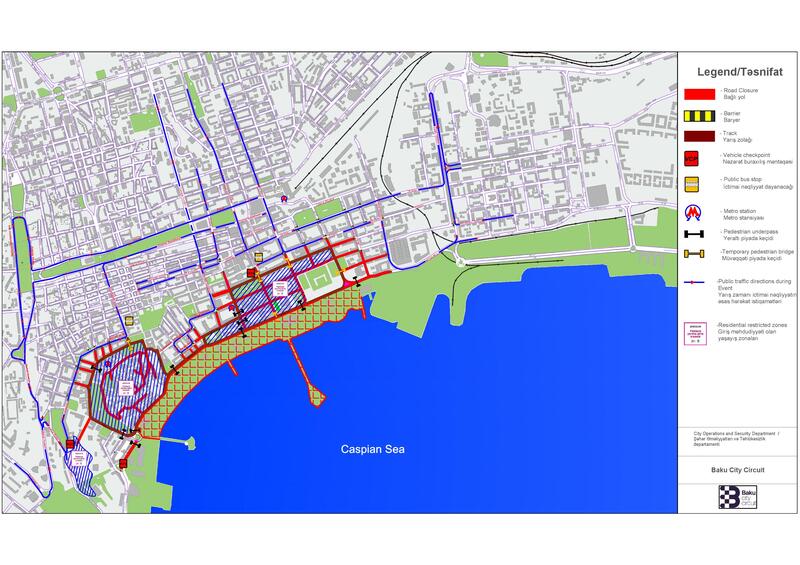 Access to the Formula One Village located at the National Seaside Park (Baku Boulevard – from Marriott hotel to Azneft circle) will be ceased for residents from April 24th (08:00) till April 29th. 4-day ticketholders will be able to access the Seaside Park beginning from April 25th at 12:00 while other ticketholders will have access to this zone on 26-27-28 April, at 10:00. During these days access to Park Bulvar shopping center will be open. Will there be any changes on bus or metro schedule on the eve of Formula 1 Azerbaijan Grand Prix? In accordance with the Traffic Management Plan which is designed to ensure uninterrupted traffic flows in the affected central streets of Baku during the race weekend, bus #65, #5 and #53 will operate from 6 AM to 2 AM on April 27-28 and 28 May, Sahil and Icheri Sheher metro stations will operate from 6 AM to 2 AM on April 26-27-28. However, exit gates at other stations will remain open till 2 AM. How to go to the Race Venue using by bus or metro? Spectators who want to take bus #65 will be required to get off at the stop near the MUM Store in Azerbaijan Avenue and proceed to the relevant grandstand by foot. Please see bus stop locations for bus # 65 below: Javad Street – Azerbaijan Avenue – Fuzuli Square – Z. Ahmadbayov Street – Tbilisi Avenue – 20 Yanvar Street – A. Maharramov Street – Mir Jalal Street This bus will operate at 5 minute interval. Passengers willing to take bus #5 are advised to exit at the stop which is located at the intersection of Rashid Behbudov and Nizami Streets and proceed to the relevant grandstand by foot. The bus will stop at the following locations throughout the event week: Narimanov Metro Station, 28 May Metro Station at Salatin Asgarova Street, 28 May Metro Station at Jafar Jabbarli Street, 28 May Street at Samed Vurgun Park, Nizami Street and Rashid Behbudov Street (close to Rashid Behbudov Theatre). This bus will operate at 3 minute interval. Ticketholders who want to take bus #53 are encouraged to exit at Intourist Hotel (Boulevard side), and proceed to the relevant grand stands by foot. The bus #53 will make stops at: 20th Zone Roundabout, Aquatic Centre, National Flag Square and opposite Intourist Hotel (Boulevard side till 17:00). This bus will operate at 6 minute interval. Ticketholders who want to go to the venue by metro can exit at 28 May, Sahil or Icheri Sheher metro stations and walk to the track. Will it be spectator Shuttle Service from Race Track to / from Baku Crystal Hall? On Saturday and Sunday, the Main Concerts will take place in Baku Crystal Hall on the Coastal Boulevard adjacent to Flag Square. The updated guide & map with the routes to and from the Baku Crystal Hall together with bus stops locations will be available at www.bakucitycircuit.com closer to Event days. Spectator Shuttle Service from Boulevard Vending Area to/from Baku Crystal Hall via Ferry In addition to the shuttle bus services, from Boulevard Vending area there will be available a free of charge ferry transfers to and from Baku Crystal Hall.